Star, rescued by Madison County November, 2008 came to STAR Ranch for rehabilitation. His Mother had died and he only had this miserable stall to live in. His dad, Big Boy, lived in the stall next door. Despite all efforts, Big Boy could not be saved. We promised Big Boy as we let him go, that we would take good care of his son, Star. Star was like a feral child. 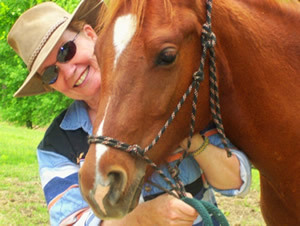 He needed to learn to ‘talk’ equus, and did from an old mare and learned the ways of life from an old gelding. He was soon running, jumping, eating and enjoying life with his new herd. He learned to load into a trailer, walk on a lead, put on a halter and munch cookies. He proved to be exceptionally smart and willing to please. We believe he knew he had his Dad to live up to. Then the big day came when Star was adopted by a young man going to an equine college in Ohio, a division of Ohio University. Star’s education would continue with the best possible teachers in a beautiful facility with other good horses. He would have a forever home just outside of Cincinnati – not too far to stay in touch. Karen gave him one last hug, lead him to the trailer where he loaded perfectly, then watched him pull out of the S.T.A.R. gates. As he looked out the back window of his trailer, wondering where he was going, everyone’s heart broke just a little and tears wouldn’t stop. But, this is what S.T.A.R. ranch does best. We take the abused, neglected and broken horse and turn him into the magnificent animal he was intended to be with a safe, secure future full of love and proper care.